The Port of Hamburg viewed from above Landungsbrücken. © Mia Bennett 2014. 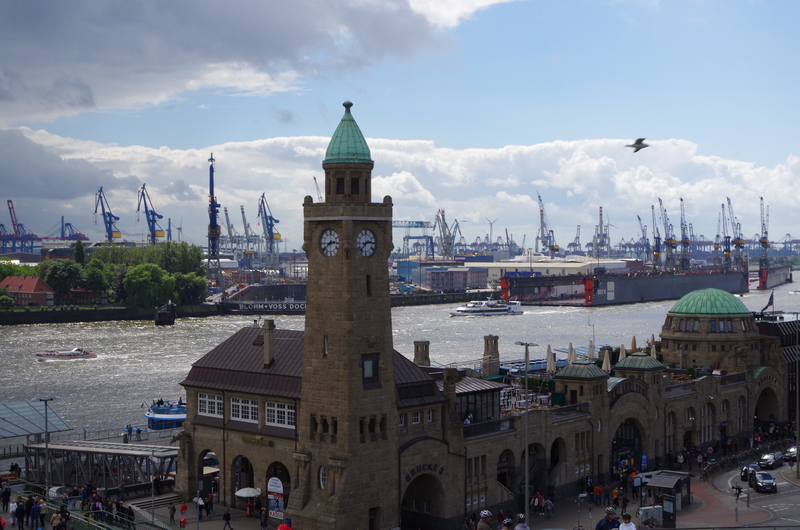 The port city of Hamburg, Germany actually lies 130 kilometers inland from the North Sea. Despite this distance, it has been an important maritime trading hub for centuries thanks to the wide Elbe River, which flows out to the sea, and its many waterways. The glory days of the Hanseatic League are still reflected in the official name of Hamburg, which is a city-state: Free and Hanseatic City of Hamburg. German reunification after the dissolution of the USSR resulted in the reestablishment of trade ties with central and Eastern Europe along the Elbe, positioning the port for success in the 21st century. Now, Hamburg is also well-positioned to take advantage of advances in Arctic shipping, especially along the Northern Sea Route (NSR). In 2012, Hamburg was the 14th biggest container port in the world, moving 8.86 million twenty-foot equivalents (TEUs) (though for comparison’s sake, the world’s number one container port, Shanghai, moved nearly four times as many containers ). That same year, the Port of Hamburg was also the second biggest in Europe, falling below Rotterdam, in the Netherlands, and just edging out Antwerp, in Belgium. As this map illustrates, the Elbe River’s watershed leading out from the Port of Hamburg allow for easy transport to other places in Germany and beyond, with barges traveling to Berlin and even as far as inland ports in the Czech Republic . These connections reveal the ways in which even landlocked countries in Central Europe could benefit from the opening of new Arctic shipping routes. Europe’s three biggest ports – Rotterdam, Antwerp, and Hamburg – are all located on or near the continent’s northwest coastline that faces the North Sea, and for logical reasons. Ships coming from either the north or south prefer to deliver goods to much of continental Europe here, as they do not have to navigate around the Jutland Peninsula, the part of Europe mostly belonging to Denmark that sticks out like a sore thumb between the North Sea and Baltic Sea. Nor do they have to navigate the shallow waters of the English Channel – one reason why no major ports have ever emerged on the north coast of France or south coast of England despite their relatively economically strategic positions. Through these three Dutch and German gateways, goods from the rest of the world, whether computers made in China or oil produced at Russia’s Prirazlomnaya project, are even delivered to regions more closely located to ports along the Mediterranean. As this article from Port Technology explains, the hinterland of these three northern European ports extends as far south as southern Germany because the Alps create a difficult barrier to cross for the trucks and trains that might otherwise be able to come from nearby Italian ports. Additional reasons that give the Arctic advantage to Europe’s northern seaports are that they already have significant economies of scale, deep water, and the ability to receive the world’s largest container ships, which are nowadays ferrying the massive cargoes from Asia. 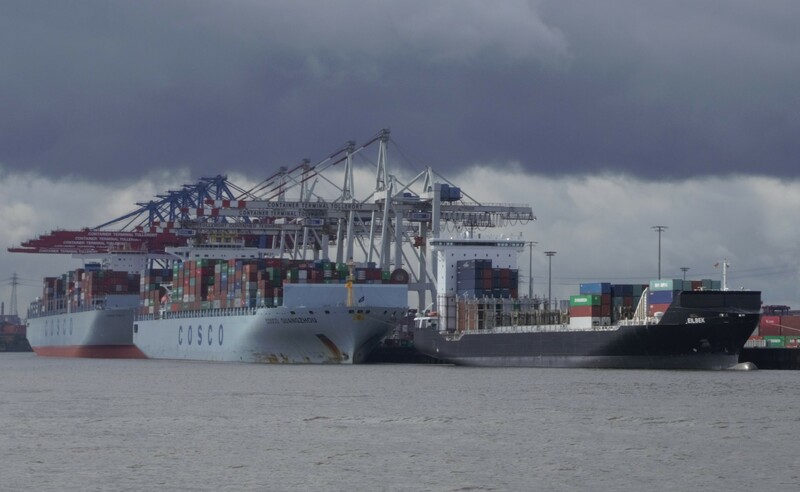 Two COSCO ships being unloaded at the Port of Hamburg. © Mia Bennett 2014. 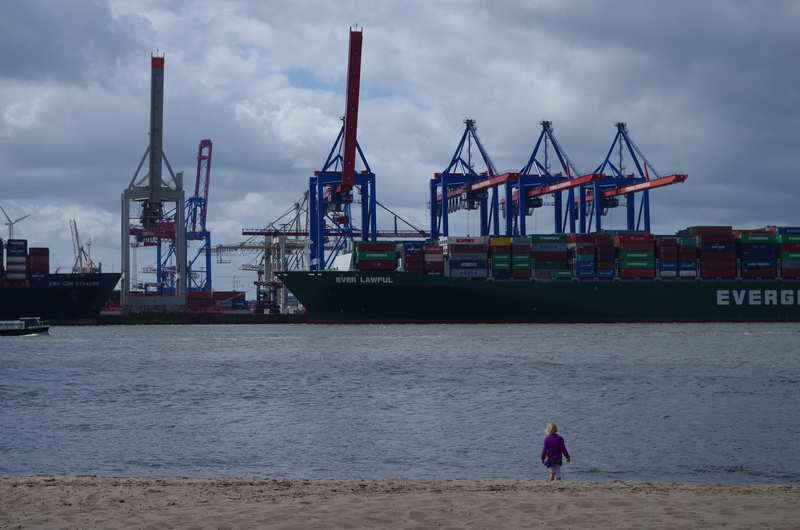 When I visited the Port of Hamburg earlier this week, these connections with Asia were visibly striking. Every other container seemed to have COSCO (the state-owned China Ocean Shipping Group) emblazoned on its side. Singapore-based Evergreen Shipping also had a container ship being unloaded. While no ships transiting the NSR traveled to or from Hamburg last year, in 2012, MV Nordic Odyssey transported 71,786 tonnes of coal from Vancouver to the German city. The NSR is about 3,000 miles shorter than the more typical Panama Canal route between the two ports. The small, Danish-based company Nordic Bulk Carriers, with only 14 employees in Copenhagen and 3 in Singapore, operates MV Nordic Odyssey – again highlighting the links between Asia and Nordic countries when it comes to maritime logistics. Watching the Singaporean ship Ever Lawful be unloaded in the Port of Hamburg. © Mia Bennett 2014. As I write this post, the first day of the “Arctic in the Anthropocene” summer school in Potsdam, Germany has just concluded. The program is organized by a number of German research institutes, including the Alfred Wegener Institute (AWI), the GFZ German Research Centre for Geosciences, and the Institute for Advanced Sustainability Studies, so there’s no shortage of polar research being done in this non-polar part of the world. This morning’s presentation by the AWI even had a slide illustrating their fleet of ships (including an icebreaker, Polarstern). All pretty impressive considering Germany is not a traditional Arctic state. But since it is a maritime one – just like South Korea, China, and Japan – we should not be surprised by these countries’ interests and activities in the areas of Arctic shipping, science, and technology.